Clarins’ fragrances are unique in the sense that they not only smell pretty darn fantastic, but because they also act as skin treatments that, thanks to generous helpings of natural ingredients, serve to stimulate, tone, moisturise, soften and soothe the skin. If all of that weren’t enough, each of the three fragrances in the line serves as an excellent fragrant pick-me-up for those days when coolness, freshness and moisture are much needed to combat the heat and humidity – perfect for the mini-heatwave we are having at the moment. 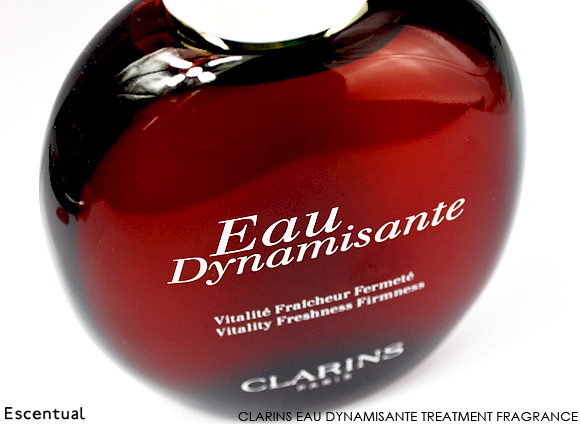 Eau Dynamisante is the first and original Clarins treatment fragrance and it’s a bit of a stealth classic. Having been on the market for an impressive 26 years it has found its way in to the hearts and homes of many a perfume lover, with a bottle being sold every three minutes within the UK. The top notes fly out of the bottle as a bracing wall of citrus, with lemon, mandarin and orange colliding together to create a wonderfully sharp and tangy breeze of scent. Rosemary and lavender quickly join the fray, adding an herbaceous quality and a slightly menthol undertone. In the base Eau Dynamisante is a true chypre, showcasing bitter notes of patchouli and moss, with tiny hints of addictive petitgrain. What was at first, bracing and refreshing settles down to a translucent veil of deep greens and cold earth that both smells and feels nourishing. Eau Dynamisante is the perfect fragrance for the hot, sticky weather. It manages to cut straight through the mugginess, acting as a welcome relief from the heat. My advice: buy a big bottle and spray with reckless abandon! Eau Ressourçante is an interesting fragrance, namely because it manages to capture in scent, the blue colour of the bottle it is carried in but does so without smelling overtly aquatic or oceanic. It is also the most cooling of the bunch and more importantly – the most abstract. Basil is the key player here along with iris, which adds a grey edge to the startling blue. The overall effect is of a vitalising skin cream that is both nourishing and soothing. 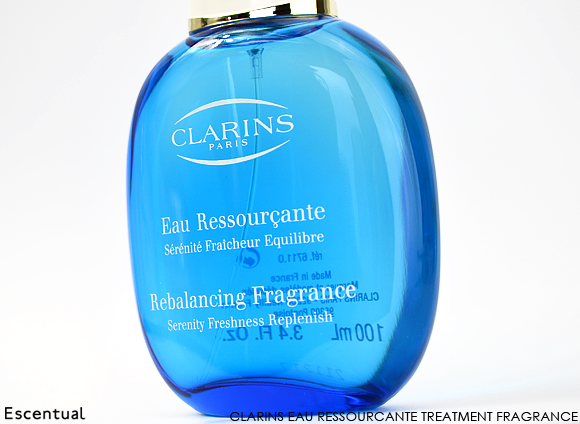 There is a slight soapiness that is somewhat off-kilter at times but for the most part Eau Ressourçante is a unique yet undemanding ode to the Clarins beauty regimen. If I were told I was only allowed to own one of the Clarins fragrances I would pick Eau des Jardins. It would be a close race and a very difficult choice, but Eau des Jardins would just about pip the other two to the post – seriously it’s my new jam for summer. 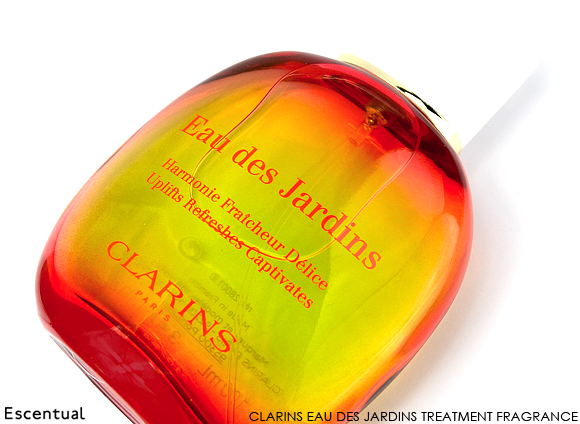 Released in 2010, Eau des Jardins is distinctly different from the other two ‘Eaus’ in the sense that it opts to evoke juiciness as opposed to freshness. This juicy quality comes from a cocktail of freshly picked, dewy fruits such as grapefruit and orange, along with lemon and bergamot with the clear, crisp odour of both apples and limes. The bubbling quality of the fruity top notes surprisingly lasts for most of Eau des Jardins development before gently giving way to a smooth bed of vegetation – all green leaves, twigs and musk. It sounds a tad twee to describe a fragrance as ‘simply delightful’ but that really is the best description for Eau des Jardins, a fragrance that evokes the image of a tropical garden, bursting with intense refreshment. Fantastic new fragrance for the summer months. Subtle scents do not overpower you when you wear it. 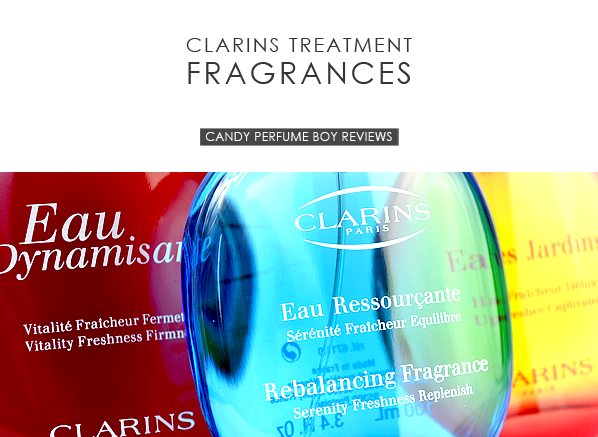 This entry was posted on Wednesday, July 10th, 2013 at 3:12 pm and is filed under Candy Perfume Boy, Fragrance, Guest bloggers, Hints & Tips, Tried & Tested. You can follow any responses to this entry through the RSS 2.0 feed. You can skip to the end and leave a response. Pinging is currently not allowed. I’ve never smelt the others, but used to own the original Eau D and found it so captivating, addictive and unusual. I always felt it was quite masculine (I know these treatment sprays can be unisex) and despite being such a girly girl I really liked that about it!